Microsoft has taken a great deal of time and put a tremendous amount of resources into developing the management interface for Office 365. Microsoft designed this interface for everyday users with the idea being that it doesn’t take an IT expert in order to manage the Office 365 product. The main Office 365 management interface is actually a website you navigate to with your favorite web browser. A web interface for managing an online product is nothing new. If you have ever used Facebook or LinkedIn, then you are familiar with using your web browser to manage an online product. The Office 365 management interface is no different; it is just the interface designed by Microsoft to manage their business cloud product. 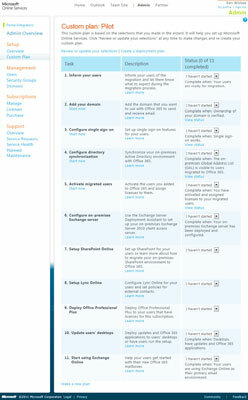 You sign in to the Office 365 management page by using the credentials you used to sign up for the Office 365 product. After you have signed in, the Office 365 management website appears. The management interface focuses on the medium/enterprise plan. If you are using the professional/ small business plan, you will have fewer management options. The management website includes sections down the left-hand navigation for Setup, Management, Subscriptions, and Support. In addition, you can click a link at the top of the page that lets you quickly navigate to your e-mail by using the Outlook Web Application (OWA) and a link to take you to your company portal (SharePoint Online). on-premise mailboxes and configuring services. subscriptions for your Office 365 implementation. service request overview, and diagnostic tools. this page, you can open and monitor service requests. additional information, and service restored. The center of the administration screen contains a list of tasks you should perform right away. These are titled “Start here tasks” and include items such as watching overview videos, adding users, and creating a deployment plan. In addition, there are shortcut links to administrative tasks such as assigning licenses, resetting user passwords, and creating a service support request. 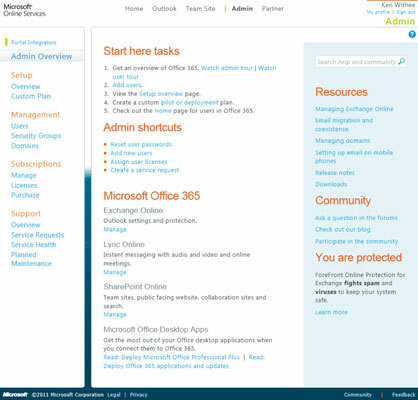 The final part of the main administrative page includes links to the management pages for each of the Office 365 components, including Exchange Online, Lync Online, SharePoint Online, and Office Professional Plus.